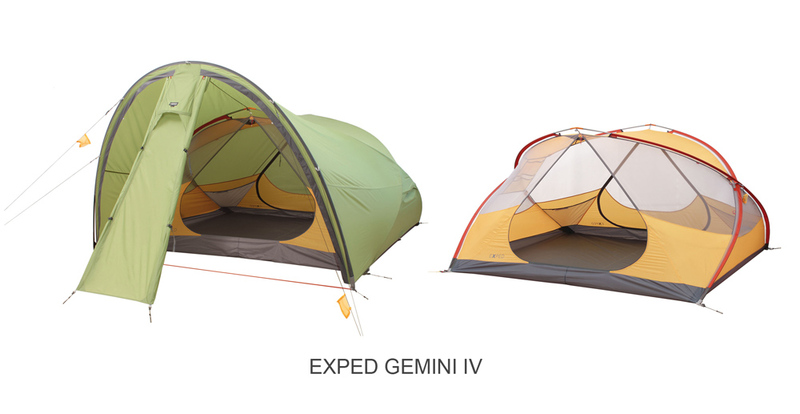 The Gemini IV is new for 2013 and will be available in March. It combines the massive vestibule space of the Venus III Deluxe Plus with the rapid set-up, excellent ventilation, and roomy design of the Gemini series tents. 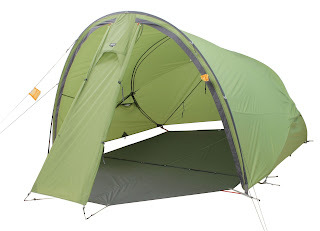 As you can see, this is a big tent, but don't underestimate it's backpacking capabilities. 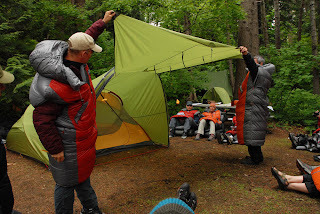 At 10.7 lbs for the tent, poles, and fly, the per person weight is still right around 2.7 lbs. We consider this a 3-season tent due to the large areas of mesh and relatively large panels, but when guyed out it is very solid in a storm. The other Gemini models (II & III), were called out in several magazine reviews in 2012 as being rock solid and GIV carries on that tradition. The most noticeable feature of the GIV is its front vestibule (it has a smaller one on the back door). It's tall enough for a person under 6 feet tall to stand up at its apex. This creates a space for dressing before heading out into the world or removing wet layers without getting the inner tent, or its occupants, wet in the process. With a total of over 50 square feet of vestibule area (front and back together), there's also a lot of space for gear. 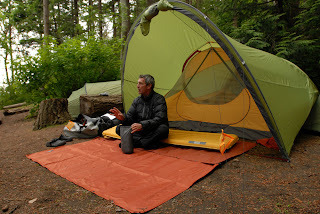 Keep those boots and pack out from under the rain but not in the sleeping area. That final image you see at the bottom is fun, eh? It shows the Gemini IV with the new Outer Space attached to its back door. The Outer Space is an accessory vestibule that works on all the Mira and Gemini tents as well as several tents in our 4-season line-up. New for 2013, Outer Space will also be available in March. OK, there you have it - Gemini IV. Comfy, cozy, big, and stout.